If you’re on the lookout for Super Bowl tickets, be prepared to fork over several thousand dollars. But if you make it through the gates, here’s a bit of good news for your wallet. A hot dog can be had for a couple of bucks. A slice of pizza will set you back a mere $3. Mercedes-Benz Stadium, which made waves in the sports industry by becoming the first facility to introduce so-called “fan first” pricing at its concession stands, is keeping those budget items on the menu for the biggest event in its short history — Sunday’s NFL title game between the New England Patriots and the Los Angeles Rams. So, if your stomach is growling but your bank account is light, consider a pretzel or popcorn. Like the hot dog, each of those stadium staples is just $2. For that same price, you can wash it all down with a bottle of water or a soft drink that comes with free refills. If you’re in the mood for something stronger, a domestic beer checks in at $5. 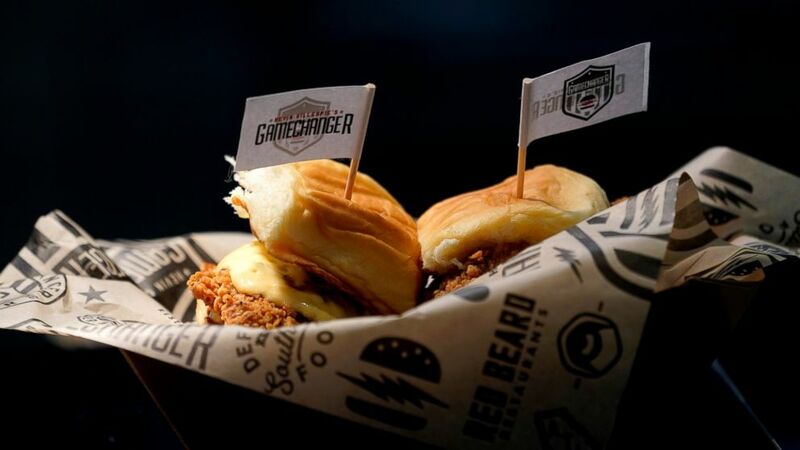 The $1.5 billion stadium, which opened less than two years ago and is best known for a complex retractable roof that opens and closes like a camera lens, is also looking to make a Super splash with some of its higher-priced food items. Especially those that show off the South’s culinary heritage. A hefty order of chicken and waffles, accompanied by sorghum butter, creamy cole slaw and sweet pickles, checks in at $12. But the item likely to make the biggest splash with fans is the “C.O.S.” — the Closed On Sunday chicken sandwich. That is renowned chef Kevin Gillespie’s take on an Atlanta staple, the Chick-fil-A sandwich. While the $14 price tag might sound a bit hefty compared to some of those aforementioned budget items — and certainly to a Chick-fil-A offering — it’ll probably seem worth it when you’ve finished off a fried chicken breast (sorry, the seasoning is a closely guarded secret) lathered in spicy pickled mayonnaise and served between two honey butter buns. There’s actually a Chick-fil-A stand within Mercedes-Benz Stadium, but as everyone in this part of the country certainly knows: the fast-food restaurant is closed on Sundays (hence the name of Gillespie’s creation). Yep, even on Super Bowl Sunday. That spot will be occupied by another vendor, so Gillespie has the big game’s chicken sandwich spotlight all to himself. The Mercedes-Benz cooks also came up with several items to honor the Super Bowl teams. The “L.A. Chicharron Dog” is an homage to the team from La La Land — a hot dog covered with pinto beans, jalapenos, garlic, roasted poblano pepper strips, cotija cheese, tajin-seasoned chicharrones (essentially, fried pork rinds) and cilantro. Not exactly for the faint of heart (or anyone with heart issues). Speaking of an angioplasty waiting to happen, the offering for the AFC champion Patriots is the “N.E. Beantown Frank,” which is covered with northern beans, maple syrup, Nueske’s bacon and green onions. On the drink side, there’s the PaLomA (yes, the “L” and the “A” are capitalized for obvious reasons), a libation comprised of tequila, ruby red grapefruit, soda water and a blood orange wedge. Patriot fans might prefer to opt for the New Englander — vodka, cranberry and soda water adorned with a lime wedge. Much like the teams that will be looking to claim a title on the field, Mercedes-Benz Stadium is eager to grab a prize of its own in the kitchen. The champion of Super Bowl stadium food.